The R195 is a new design based on the heritage of the classic R190 second stage. 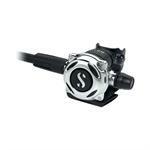 Scubapro Once again sets the standard for second stage regulator performance with the A700. Integrating air-balanced valve technology, the A700 brings you extraordinary breathing performance in a striking, precision-handcrafted, full metal package.